The government is still refusing to change the way sanctions are imposed on sick and disabled claimants or examine the impact of sanctions on their wellbeing, according to the commons work and pensions committee. 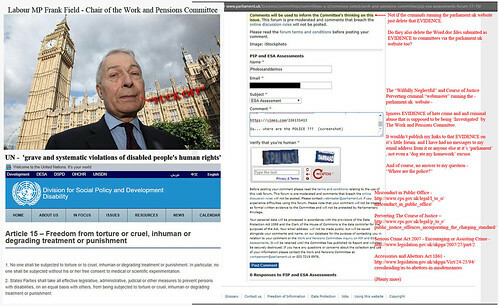 The committee chair accused the DWP of pushing disabled people into ”grinding poverty and hardship”. “We have heard stories of terrible and unnecessary hardship from people who’ve been sanctioned. They were left bewildered and driven to despair at becoming, often with their children, the victims of a sanctions regime that is at times so counter-productive it just seems pointlessly cruel”. In a response published today, however, the government have rejected the recommendation by the committee that claimants already found to have limited capability for work should be exempt from sanctions. It has also rejected the recommendation that claimants who are waiting for a Work Capability Assessment should be exempt from sanctions if they had a “Fit Note” from a doctor saying they were unable to work. The most that the government is prepared to consider, is to “explore the possibility of a Proof of Concept (PoC) that conditionality would not be imposed on claimants before their WCA and those assessed as having Limited Capability for Work”. But even if this was introduced, the final decision would still be in the hands of work coaches as to whether to apply the policy to each claimant they dealt with. In other words, work coaches would still be free to recommend sanctions for any claimant and the DWP would still be willing to impose them. As far as evaluations are concerned, the government is only prepared to look at how effective universal credit sanctions are at helping people into work. No research will be carried out on how sanctions affect the health of disabled claimants or the degree to which they push them into poverty. ← Have You Been Forced To Attend Two PIP Assessments For One Claim? “Just following orders” is not a valid defence. All DWP Murdering, Torturing, Abusing, Hate Criminal Fraudsters should be in prison. Along with the vermin protecting them, like the BSing ‘crocodile tears’ MP’s and FAKE ‘Advice’ BS from course of justice perverts like Benefits And Work. So where are those Do Nothing criminal MP scumbags POLICE?? ?